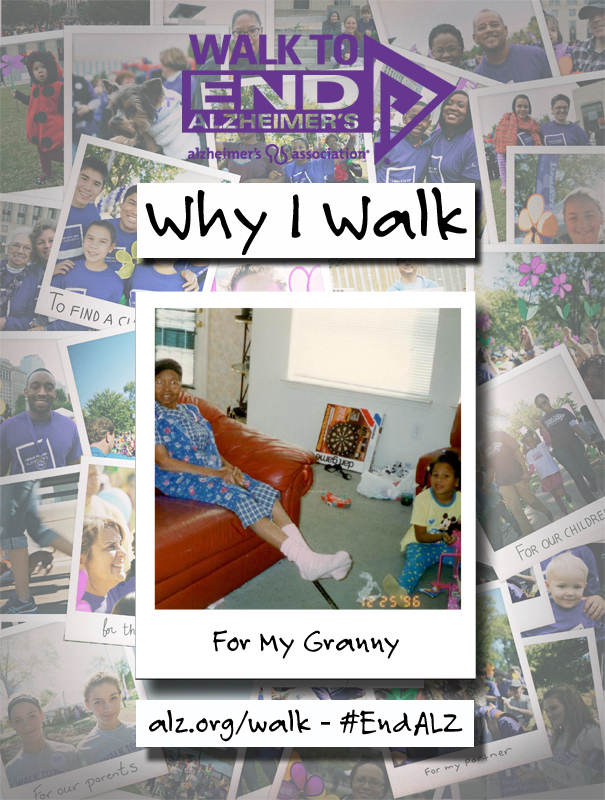 My name is Sydney Cameron and I Walk to End Alzheimer’s for my granny. Some of my earliest memories of my grandmother (when I was around 6 years-old) are when she would travel from her home in Chicago to visit our home in Dallas. She would always sleep with me in my room. My parents even bought me a queen-sized bed so we could share it together. It wasn’t until I was a teenager that I realized my granny wasn’t quite the same as when I was younger. She didn’t fuss at me anymore and she didn’t always have a hug or smile ready for me when I walked into a room. She stopped visiting our family in Texas. It was then that I learned she suffered from Alzheimer’s disease. As a teen I’m not sure that I fully comprehended what it all meant. I just knew every time our family would visit her in Chicago she talked less and less. Then I noticed she moved less and less and eventually could no longer even feed herself. One vivid memory I have is one day my mom was giving her a pedicure and keeping up a constant stream of chatter. Every once and awhile my grandmother would make a non-committal noise. But, after all these years it was her eyes that I still remember the most. Every time my mom moved my grandmother’s eyes would follow. It was like she recognized her daughter even though she couldn’t voice it. My granny, Valadia Williams, traveled to the Kingdom of God in 2007. I Walk to give her, and everyone else who has Alzheimer’s, a voice. I Walk to relive those memories. I Walk to walk with her one more time. I Walk to give strength to others. I Walk to end Alzheimer’s.